What is SEO for mobile and how to perform it? Being mobile and having the mobile is the latest trend and everyone is involved with it. The entire universe of online sites stops, advertising, campaigns and everything else is found in just a device in your hand. The aspect of mobile web browsers and launch of Smartphone have changed the overall scenario of the online world. Now when an online market is optimizing itself according to mobile, that means you and your site also should be. This is the rise of mobile SEO. In this article, we are going to have some general information about the meaning of mobile SEO and the way it can be effectively applied for the best benefit of your business. 1 What is Mobile Search Engine Optimization? In the view of traditional marketers, mobile SEO is a new breed of wild horse. While you have enough knowledge about how to deal with search engine optimization activities for the internet, you are about to learn and understand a whole new theme or skill that is known as mobile SEO. In the given paragraphs, we are also going to analyze its difference from traditional or standard SEO and its basic components. Many sites that you find and work on the web are also found on your mobiles such as Google, Facebook, Twitter, Yahoo and much more. You are also familiar with their mobile version and using it. Today there is a well-defined distinction between mobile sites and their computer enabled version. Google and Yahoo also have their two versions, one that you see and work on your computer and the next one you carry with yourself using mobile internet. As the marketer or a newbie in the mobile SEO field, you need to learn that how it works and what is the principle of mobile SEO are to be applied to a website that already has a perfect appearance for standard SEO. It sounds a bit confusing but it is not the reality. Mostly the mobile websites are written under a specific code often known as XHTML, a simplified version of standard HTML and popularly applied for creating web pages on the internet. Mobile sites are also easily compatible with the domain .mobi. Now, this is extremely needed to have a .mobi domain or a Site written in XHTML so that you can create a sound mobile website and ensure its impressive and striking mobile appearance. But the sites created under .com domain or any other extension that was obtained by you while creating also can be found by the mobile search engine without any trouble. Though it is not compulsory often recommended by experts that XHTML code should be used for creating mobile pages. The pages or sites created under such code are a bit easier to be accessed by a huge number of mobile users at the same time and help a wider section of the audience to find your site. Either you can hire a professional to perform this task for you, or if you are interested in creating or converting the web pages by learning XHTML code, it is not that difficult. There are a good number of online and offline XHTML tutorials out there where you can get enough knowledge about creating and converting the web pages as per your needs. It is also good that you learn the overall procedure and application of XHTML code in both the mobile and its computer-based version. This will clear many tricky complications about this code and you will find yourself quite confident to deal with any page creation or conversion problem. You cannot achieve the mobile SEO for your site just by applying the right code while creating it. Never forget that similar to the computer users, mobile users also visit a search engine, looking for some specific information on the internet. You will surely want to target these people to find and visit your site no matter they are using the search engine from any device, traveling laptop, smartphone or home desktop computer. When you already have a well set online presence, you may surely have search engine optimization in the place on your existing site. It is time to add mobile SEO to your existing pages. As the very first step, you need to be assured that your site is ready and definitely opened for mobile search engine spiders to access and scan. While your website contains the web pages that are large in size and aiming a very large group of an internet community, you are required to include a specific META tag that makes your page available for search spiders to scan it whenever users type the keywords in the search box. When your page is easily being accessed and scan by different search engines, it is the time to take the further steps and that usually does not include the specific coding at all. Here you have to let the search engines understand that you are in the position of attaining visitors’ traffic to your mobile site. There are many tops placed mobile search engines are being followed by people such as Google, Yahoo, Bing, MSN and AOL Mobile. You should not waste your time in considering the best among them. All you have to do is gaining their attention. Submit your site to get it. Yahoo provides a user-friendly link where you can paste or insert the URL of your site right into the blank box. By clicking submit you will start receiving mobile web traffic from Yahoo. It is the simpler process but does not forget that now the actual painful process starts, making and maintaining your site viewable and attractive to the mobile user community. 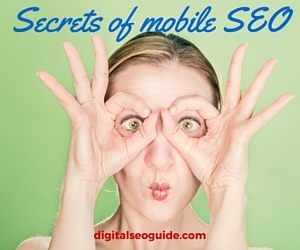 When the submission of the site successfully takes place, your next big focus is mobile SEO. There is a good amount of reading the material or the tutorial availed by Google that will guide you to make your site ready for their mobile search engine. It also contains the process and necessary directions that will assist you in a submission of a site for their scans. When your site is submitted to the leading search engines, you have won half the battle.As the next part of mobile SEO, you have to work on optimizing.You have used the right code and ready to receive the traffic, it gives you a sound baseline.Now concentrate on optimization of your pages standard / regular and mobile web.So, are you ready to learn the secrets of mobile SEO? Surprise!! There is nothing special or new to learn. Mobile SEO has nothing different from the standard Search Engine Optimization practice you have been already applying to improve your web presence and boosting internet traffic.It is also about using keywords and sound content. As the simple or basic mobile SEO content strategy, each blog post, article or any other piece of content should be developed revolving around the two to four keyword phrases, set or developed under your keyword research strategy.It will be an ideal content if you include a keyword rich title, subtitle or main heading with every blog post, video introduction or caption of an image. There nothing much variance in mobile SEO and standard SEO. Keywords are the real heroes and content are the placeholder for all those important phrases.